Home / Stock Picks / Stocks to Buy / Should You Follow Bill Ackman Into Starbucks Stock? Should You Follow Bill Ackman Into Starbucks Stock? Is anyone else surprised by the rally in Starbucks (NASDAQ:SBUX) right now? I certainly am — and it’s one of my longest held positions! Last we saw, Starbucks stock was tanking as it pre-announced worse-than-expected earnings. Shares were making multi-year lows in the summer and all the talk was about how this is the end for the world’s premier purveyor of coffee. Now shares are up some 22% from the lows. In fact, not only has the stock done well since bottoming in early July, SBUX stock has actually outperformed during the latest pullback in the market. In the last five trading sessions, the SPDR S&P 500 ETF (NYSEARCA:SPY) is down 1.4%, while the PowerShares QQQ ETF (NASDAQ:QQQ) is down more than 3.3%. Worth nothing is that Starbucks stock is actually a top 25 holding in the QQQ ETF, and despite the fund’s underperformance, SBUX is up about 4% amid all of this mess. The 2% bump on Tuesday came from Bill Ackman’s stake and presentation on Starbucks. But even before then, it was holding its own. Let’s explore. Titled “Doppio,” the presentation from Ackman’s Pershing Square was a reminder at just how well Starbucks is doing. Sure there are concerns over sluggish same-store sales, particularly in the U.S. as SBUX can’t seem to get out of low-single-digit growth. While the market is clearly dismissed last quarter’s negative comp in China, that won’t be the case if Starbucks reports another contraction in its second-largest (and fastest-growing) market on November 1st. Pershing’s in with 15.2 million shares at $51 a pop. It’s good for a $775 million position that’s since grown to $877.2 million provided it’s strictly stock ownership. That’s good for a stake of about 1.1%. Nothing massive of course, but a lot more than you and I own, right? Ackman points out that Starbucks stock trades with a current P/E ratio of 22, “a substantial discount” to its three-year historical average of about 26. He also points out that thanks to Starbucks’ recent divestitures and its strong core business, the company has significantly increased its capital return. After a 20% dividend bump in November, the company again gave a 20% increase this summer. It will also buyback about $14 billion worth of stock over the next two years, or about 18% of its market cap, according to Pershing. More interesting points include the notion that teens are opting more for coffee drinks rather than soda. Coffee penetration has gone from 21% in 2014 among 13-to-18 year olds to 37% in 2017. Conversely soft drinks have declined from 45% to 42% during the same span. While not mentioned by Ackman’s team, coffee prices recently hit 12-year lows last month, which should help with margins. Because of Starbucks’ superior compensation plan, it should be insulated against rising wage pressure, Pershing also argues. Finally, they argue that a base-case price target for September 2021 is $93. Inclusive of dividends that goes to $97. The upside case makes an argument for $117 and $122, respectively. Even in the base case assumption (excluding dividends) we’re talking about a 63% rally over the next three years. So how do we trade Starbucks stock? So long as SBUX stock stays above that steep uptrend support (black line) and/or the 200-day moving average, investors can stay long. Look, for as many problems as Starbucks is having, we have to remember a few things. For one, the company is buying back an enormous amount of stock. That’s reminiscent of Apple (NASDAQ:AAPL), which has a massive, constant buyer in its stock. Starbucks is also still churning out record earnings and sales each quarter. So same-store sales may be 2% instead of 5%. That hurts the valuation, but the business is still quite robust. 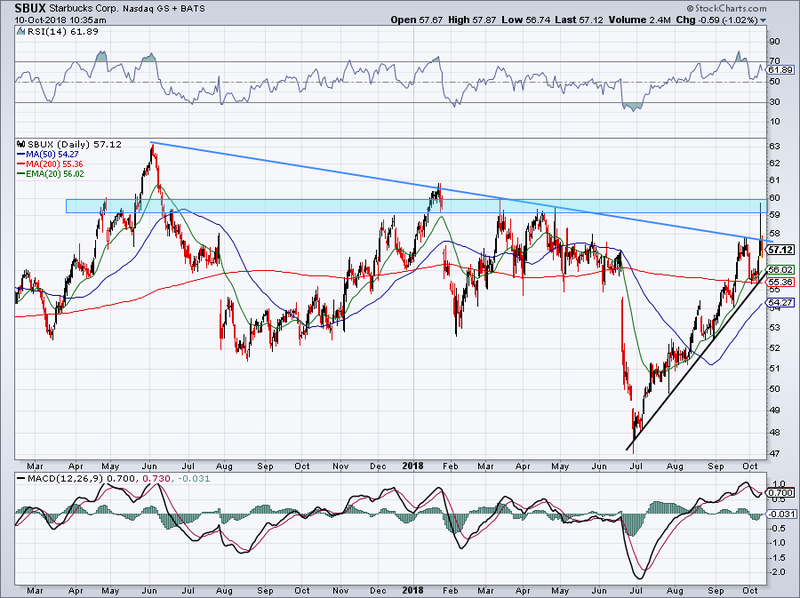 On a rally, see if SBUX stock can takeout downtrend resistance (blue line) and how it handles that $59 to $60 area. So far, it’s been rejected both times. If it holds the 200-day and 50-day moving averages post-earnings on November 1st, that’s a very good sign. Bret Kenwell is the manager and author of Future Blue Chips and is on Twitter @BretKenwell. As of this writing, Bret Kenwell is long SBUX and AAPL. 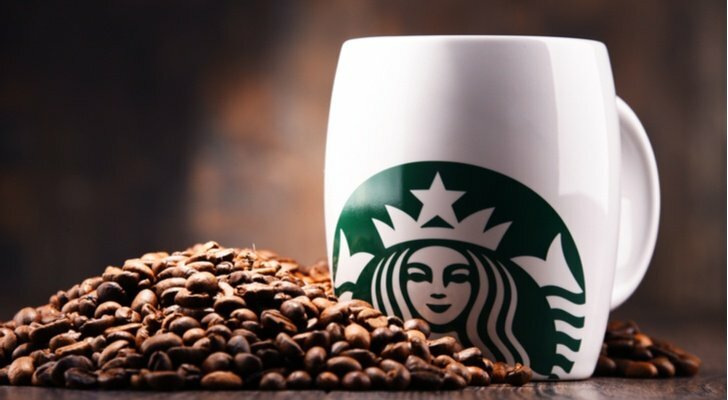 Article printed from InvestorPlace Media, https://investorplace.com/2018/10/should-you-buy-starbucks-stock-like-bill-ackman/.